Darren Aronofsky's The Wrestler is so narratively straightforward and stylistically reserved (though not in any way humdrum) that I can't resist comparing it to the director's output of glittering, coal-black nightmares—Pi, Requiem for a Dream, and the underrated The Fountain—in search of a common thread. True to form, this tale of a 1980s professional wrestler gone miserably to seed bears the stamp of Aronofsky's unflagging absorption with self-inflicted personal destruction, agonies that promise redemption, release, and annihilation. Eschewing his usual taste for visual flash and wobbly grandiosity, the director here favors gritty realism sansRequiem's horror gloss. For better or for worse, there's no cleverness to Aronofsky's grim gaze in The Wrestler. The film delivers a naked portrait of human endurance, fragility, and entropy, in both their physical and emotional aspects. As the creased and battered Randy "The Ram" Robinson, Mickey Rourke captivates, conveying both the wrestler's pummeled dreams and the pained simplicity of his ambitions. Aronofsky shies from operatic gesturing, but he also exhibits an unfortunately limp, aimless reliance on sports film tropes. Ultimately, The Wrestler as a fascinating slice of elegant, trim realism, a refreshingly humane vehicle for the director's compelling, if morbid, artistic sensibilities. Ari Folman's troubled, magnificent Waltz with Bashir embraces a style/genre mating guaranteed to shake up cinematic expectations: the animated documentary. Wrestling with fragmentary memories of his days in the IDF during the 1982 Lebanon War—especially an unmoored, hallucinatory recollection involving flare-illuminated skinny-dipping—Folman interviews former comrades-in-arms and others who were involved in the conflict. The notorious massacre of Palestinians at Sabra and Shatila looms over the proceedings, and the film lurches with a swelling dread towards Folman's anguished understanding of the events and his own culpability. 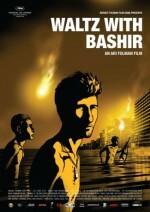 Bashir's visuals are stunning, and the film's sharp contrasts in color and motion serve to deftly highlight its wickedly rendered mood and sobering themes. As in the most powerful, personal examinations of horror, it's the details that stick: a soldier mopping gore from the inside of his tank, an RPG screaming in agonizing slow-motion through a fruit grove, a journalist walking slowly and unconcernedly through a firefight. Folman tackles the timeless concerns of warfare, particularly its sheer uncanniness, with a thematic discipline that provokes while never seeming obligatory. Bashir's primary fascination is memory's role in tallying guilt and digesting the seemingly unfathomable, and in this it attains a rattled, grief-stained vividness. The humanistic power of Laurent Cantet's wrenching, glorious The Class is undeniable. Its naturalistic cinematic language, serviceable and modest, never truly sizzles, but it doesn't need to. Here is a film whose strength lies almost entirely in its vivid recreation of the intoxicating, dreadful humming of adolescence. Based on a semi-autobiographical novel by François Bégaudeau, the film features Bégaudeau himself as a French instructor in inner-city Paris. Bégaudeau' class is like a boat constantly on the verge of tipping over. His students are multi-cultural, rowdy, insolent, aggravated, and fiercely intelligent in staccato bursts. Yet Cantet and Bégaudeau eschew the feel-good moralizing of countless classroom dramas for electric realism, permitting the essential conflicts modern of French society (or any society for that matter) to swirl and surface naturally. In long, mesmerizing scenes of Bégaudeau herding his class through conjugation and composition, The Class conveys the cultural minefield and Sisyphean misery that its secondary education. Cantet refuses to simplify teachers as heroes, just as he resists painting every student as a potential convert to academic success. Ferocious and yet fragile, The Class is an astonishing work of social realism, one that caught my breath time and again. If Ingmar Bergman and Wes Anderson had a love child, it might look something like Bent Hamer's O'Horten, a compelling portrait of a life in transition, daubed with bits of illuminating strangeness. With a watchable blend of staid crispness and humorous insight, Baard Owe portrays Odd Horten, a taciturn, no-nonense train engineer on the cusp of retirement. The film follows Horten through a series of set pieces that can only loosely be termed a plot: a retirement party, selling his boat, purchasing a smoking pipe, meeting a drunk on the street. The film's essence lies in its moments and gestures, rather than in the narrative inertia of linked scenes. In short, nothing really happens, but it's a credit to Owe's comforting performance and director Hamer's unhurried empathy that it still engages. Uncanny sights pass us and Horten by—a man being arrested at a restaurant, a prone motorcyclist sliding past on an icy street—with Owe providing a subtle reaction and Hamer establishing a thematic context. Melancholy and determinedly gradual, it's not the sort of film for everyone. Its potency lies in its slow discovery of a distinctively Scandinavian mood and its gentle probing of abstracts such as dignity and contentment. Nacho Vigalando's trippy, morbidly witty Timecrimes is a clever little achievement, demonstrating that an absorbing, competent science fiction film requires only four actors, three sets, and a familiar premise. Middle-aged couple Héctor (Karra Elejalde) and Clara (Candela Fernández) are just moving into a new home in the country when Héctor spies through his binoculars a naked woman lurking in the woods. He wanders off to investigate, leading to a uncanny sequence of events: an assault by a masked stranger, a flight into a series of bizarre buildings, and a journey back in time (albeit only a couple of hours). What follows is a spiral of events that loops in on itself with narrative tidiness and an air of portentous self-satisfaction, as in any time travel tale worth its salt. There's a roteness to some of Timecrimes' allegedly shocking reveals, and Vigalando find the brightest sparks when he plays it fast and savvy, trusting our awareness of the genre's conventions. Never mind that the moral ambiguity to the film's conclusion—and perhaps the absence of any Twilight Zone twist—is a touch unsatisfying. The treat of Timecrimes is the thrilling, black humor that emerges from Vigalando's tightly circumscribed ambition.